﻿﻿﻿﻿﻿﻿﻿﻿﻿﻿It was not without some sadness that I left the lovely salad greens yearning for a proper salad plate in my Takoma Park community garden, not to speak of the young seedlings awaiting transplant so they could grow properly. Yet, France has its own pleasures to offer. 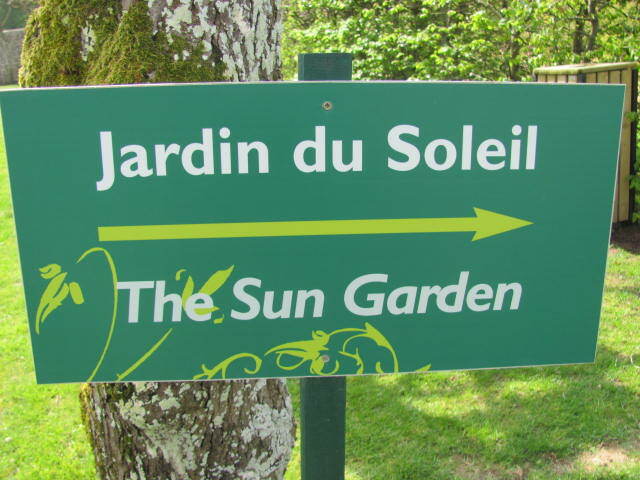 Unfortunately the word “jardin” is used pretty loosely here, and those formal ones here have been shaped forcefully into geometric configurations that feel almost cruel to those of us who are unfamiliar with this way of relating to plants. 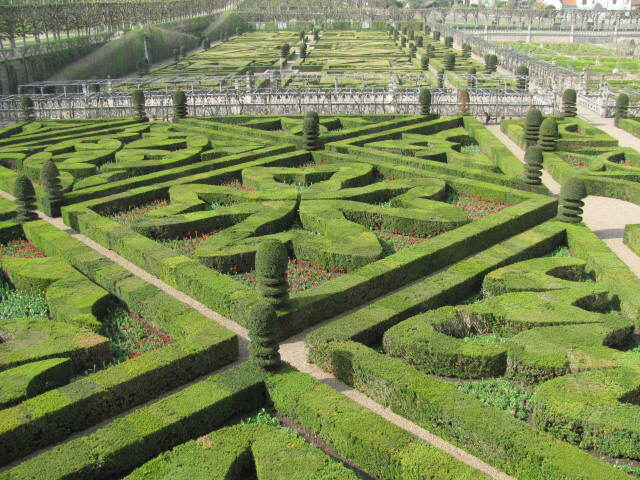 One interesting exception is the gardens of Villandry, completed around 1536, also over-organized, but with stories and history that compel skeptics such as myself to pay attention. 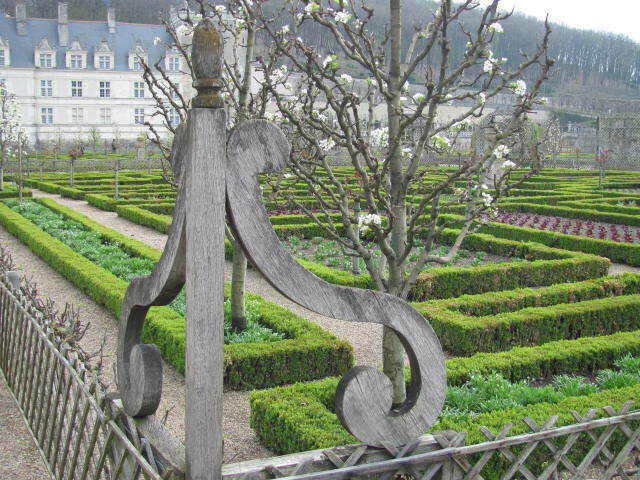 My focus, of course, was the magnificent vegetable garden or “kitchen gardens,” (requiring a bit of imagination on my part since it is only early April), which date back to the Middle Ages. It did not take much for me to picture monks tending to these lovely spaces. My walk through the woods led me to the greenhouse in the back, where, the symmetry of the garden (over 1000 lime trees all neatly aligned!) 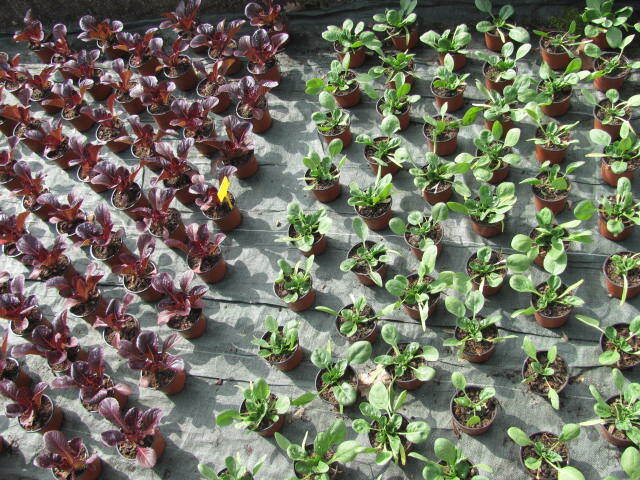 was overwhelmed by the rows of green and red lettuce, accompanied by spinach seedlings, which put me immediately into the experience of my own garden across the Atlantic. ﻿﻿﻿﻿Organic practices were introduced in 2009. 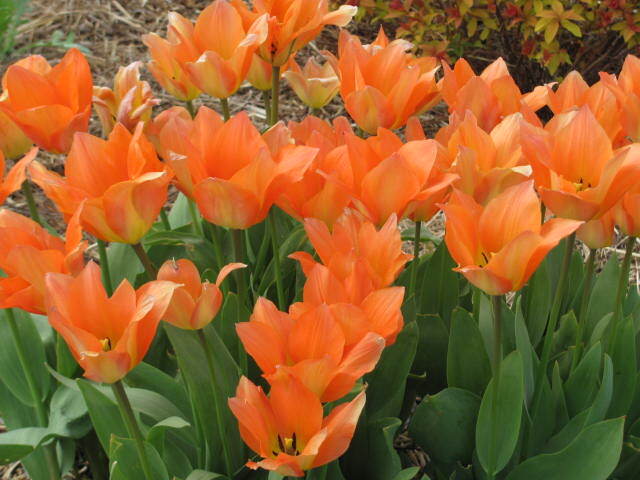 Forty species, belonging to eight botanical families are grown each year in plantings in the Spring and Fall, as well as three year rotations. Although the devotion to blues, greens and reds in this vast space in April essentially means that the beds are now populated primarily with red leaf lettuce, green leaf lettuce and some brassiac seedlings, I found beautiful purple kale amidst flowers along the ancient walls, and realized (from the herb garden) what a great ground cover may be achieved by mint in early spring…green and fragrant. The intensive pruning of pear trees, cherries and roses finally made sense to me, in a vast vegetable garden where sun is essential. I felt a mild envy of the ten gardeners who work full time to maintain the various garden “rooms” (the cloud room, the sun room, the children’s room, etc., right in the garden) and individually plant some 250,000 flowers and vegetables each year. In the end I even overcame my aversion to the ubiquitous boxwoods (I have about 40 ft of it in my backyard, free to anyone who wants to come and get it), which at Vilandry, are pruned every year–they would measure 52 kilometers in length if placed from end to end, and weeding is done by hand, apparently due to their very fragile roots. Clearly the American variety in my back yard is a far tougher cultivar. Sorry to say this has nothing to do with your post, although I love the pics. And it may be a stupid question but….how much watering is too much on veggie gardens? As you know, we are rather dry right now in Maryland. My husband and I have been arguing over how much watering is too much. Is there such thing? Also, is there a time of day it's best to water? I've heard you should not do it during a hot afternoon, is that true? Thanks for your advice. There is such a thing as too much watering, but it's hard to manage that when the weather is so dry. The soil should feel moist but not soggy down to a depth of several inches (stick your finger in). If you have planted seeds, keep the soil surface moist at all times (as far as possible). Try to water the roots of growing plants rather than the leaves. If water gets on the leaves in the evening, the moisture will remain overnight and may cause fungal diseases. This is not such a problem with plants watered in the morning, so that's a better time, but let your schedule guide you. Established plants will need watering less often, and it's better to water deeply a couple of times a week than every day. However, let the amount of moisture in the soil tell you when it's time. Hope that helps.